In vitro reconstitution of an artificial metabolic pathway has emerged as an alternative approach to conventional in vivo fermentation-based bioproduction. Particularly, employment of thermophilic and hyperthermophilic enzymes enables us a simple preparation of highly stable and selective biocatalytic modules and the construction of in vitro metabolic pathways with an excellent operational stability. In this study, we designed and constructed an artificial in vitro metabolic pathway consisting of nine (hyper)thermophilic enzymes and applied it to the conversion of glycerol to lactate. We also assessed the compatibility of the in vitro bioconversion system with methanol, which is a major impurity in crude glycerol released from biodiesel production processes. The in vitro artificial pathway was designed to balance the intrapathway consumption and regeneration of energy and redox cofactors. 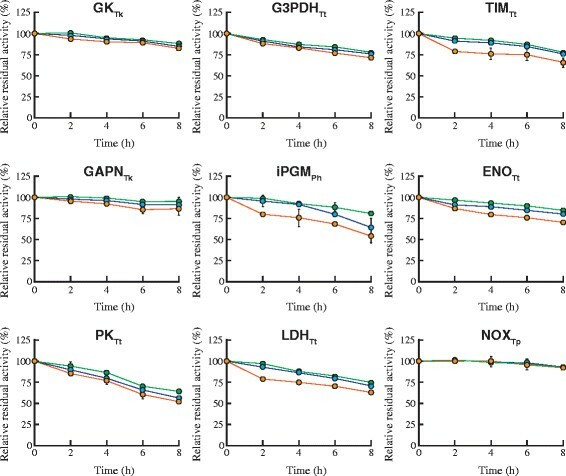 All enzymes involved in the in vitro pathway exhibited an acceptable level of stability at high temperature (60°C), and their stability was not markedly affected by the co-existing of up to 100 mM methanol. The one-pot conversion of glycerol to lactate through the in vitro pathway could be achieved in an almost stoichiometric manner, and 14.7 mM lactate could be produced in 7 h. Furthermore, the in vitro bioconversion system exerted almost identical performance in the presence of methanol. Many thermophilic enzymes exhibit higher stability not only at high temperatures but also in the presence of denaturants such as detergents and organic solvents than their mesophilic counterparts. In this study, compatibilities of thermophilic enzymes with methanol were demonstrated, indicating the potential applicability of in vitro bioconversion systems with thermophilic enzymes in the conversion of crude glycerol to value-added chemicals. Integration of diverse biocatalytic modules to construct an advanced microbial cell factory has emerged as a powerful approach for the production of industrially important metabolites . Bioprospecting efforts for exploring novel biocatalytic molecules with unique properties have inspired the design and construction of a wider variety of artificial metabolic pathways . 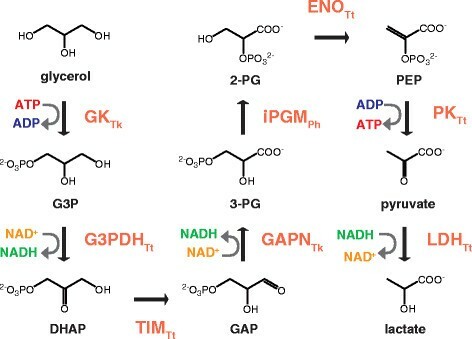 However, installation of an artificially engineered metabolic pathway in living organisms often leads to a competition with natural metabolic pathways for intermediates and cofactors, resulting in insufficient yield of desired metabolites. A possible solution to this problem is to avoid the use of living microorganisms and to construct an in vitro artificial metabolic pathway in which only a limited number of enzymes are involved. Until now, a variety of in vitro synthetic pathways have been designed and constructed for the production of alcohols ,, organic acids ,, carbohydrates , hydrogen ,, bioplastic , and even electricity . Particularly, employment of enzymes derived from thermophiles and hyperthermophiles enables the simple preparation of catalytic modules with excellent selectivity and thermal stability ,. Furthermore, although the detailed mechanisms remain to be clarified, many thermophilic enzymes have also been reported to display higher tolerance towards denaturants such as detergents and organic solvents than their mesophilic counterparts ,, and activities of some thermophilic enzymes are even improved with organic solvents . These excellent stabilities of thermophilic enzymes allow great flexibility in the operational conditions of in vitro bioconversion systems. Concerns about the global warming and depletion of fossil fuel reserves have led to the rapid increase of biodiesel production. Generally, 10 kg of crude glycerol, which is the primary byproduct of the biodiesel industry, is released for every 100 kg of biodiesel and the growing production of biodiesel has resulted in a worldwide surplus of crude glycerol . Although many studies have been conducted to use crude glycerol as a starting material for the fermentation-based production of industrially valuable chemicals, these attempts often suffer from the inhibitory effects of impurities contained in crude glycerol on the growth and biocatalytic activity of living organisms ,. Particularly, methanol, which is the most abundant impurity in crude glycerol, accounts for up to 70% (w/w) of a raw glycerol obtained through a biodiesel production process . In this study, we focused on the high operational stabilities of thermophilic enzymes and employed them as modules to construct an in vitro synthetic pathway for the conversion of glycerol to lactate, which is one of the most important and versatile biomass-derived chemical , in the presence of methanol. Glycerol and methanol were purchased from Wako Pure Chemical Industries Ltd. (Osaka, Japan). Other intermediates of the synthetic pathway, including glycerol-3-phosphate (G3P), dihydroxyacetone phosphate (DHAP), glyceraldehyde-3-phosphate (GAP), 3-phosphoglycerate (3-PG), 2-phosphoglycerate (2-PG), phosphoenolpyruvate (PEP), and pyruvate were obtained from Sigma-Aldrich Japan (Tokyo, Japan). NAD+, NADH, ADP, and ATP were products of Oriental Yeast Co. Ltd. (Osaka, Japan). 2-(4-Iodophenyl)-3-(4-nitrophenyl)-5-(2,4-disulfophenyl)-2H-tetrazolium, monosodium salt (WST-1), and 1-methoxy-5-methylphenazinium methylsulfate (1-methoxy PMS) were purchased from Dojindo Laboratories (Kumamoto, Japan). All other reagents were commercially available and of analytical grade. Escherichia coli JM109 was used for general cloning purpose. E. coli Rosetta 2 (DE3) was used for gene expression. Recombinant E. coli was aerobically cultivated at 37°C in Luria-Bertani medium supplemented with 100 μg ml−1 ampicillin and 34 μg ml−1 chloramphenicol. Gene expression was induced by the addition of 0.2 mM isopropyl β-D-1-thiogalactopyranoside at the late log phase. The expression vector encoding the glycerol kinase of Thermococcus kodakarensis (GKTk, gi| 3986088) was donated by Dr. Y. Koga, Osaka University . Sources of expression vectors for triose phosphate isomerase (TIMTt, gi| 3169211), enolase (ENOTt, gi| 55979971), pyruvate kinase (PKTt, gi| 55979972), lactate dehydrogenase (LDHTt, gi| 55981082) of Thermus thermophilus, non-phosphorylating GAP dehydrogenase of T. kodakarensis (GAPNTk, gi|57640640), and cofactor-independent phosphoglycerate mutase of Pyrococcus horikoshii (iPGMPh, gi|14589995) were described previously . The expression vector for G3P dehydrogenase of T. thermophilus (G3PDHTt, gi|55981709) was obtained from the Riken T. thermophilus HB8 expression plasmid set . Gene encoding NADH oxidase of Thermococcus profundus (NOXTp, gi|187453160) was cloned and expressed in E. coli as described elsewhere . Lactate was quantified by high-performance liquid chromatography (HPLC) equipped with two tandemly connected ion exclusion columns (Shim-pack SPR-H, 250 mm × 7.8 mm, Shimadzu Corp., Kyoto, Japan). The columns were eluted at 50°C using 4 mM p-toluenesulfonic acid as a mobile phase at a flow rate of 0.2 ml min−1. The eluent was mixed with a pH-buffered solution (16 mM Bis-Tris, 4 mM p-toluenesulfonic acid, and 0.1 mM EDTA) supplied at a flow rate of 0.2 ml min−1 and then analyzed for lactate using a conductivity detector (CDD-20A, Shimadzu Corp.). Methanol concentration was quantified by an enzymatic assay using the alcohol dehydrogenase (Sigma-Aldrich Japan) and the horseradish peroxidase (Sigma-Aldrich Japan) according to the protocol provided by the manufacturer. E. coli cells were collected by centrifugation, resuspended in 50 mM HEPES-NaOH (pH 7), and then disrupted by a UD-201 ultrasonicator (Kubota Corp., Osaka, Japan). After the removal of cell debris by centrifugation, the cell-free extract was incubated at 70°C for 30 min. The heat-precipitated proteins were removed by centrifugation, and the resulting supernatant was used as an enzyme solution. One unit of an enzyme was defined as the amount consuming 1 μmol of the substrate per min under the below-mentioned standard assay conditions. Protein concentration was measured with the Bio-Rad protein assay kit (Bio-Rad Laboratories Inc., Hercules, CA, USA) using bovine serum albumin as the standard. Enzyme activities were spectrophotometrically determined at 60°C by monitoring consumption or generation of NADH at 340 nm. When necessary, NADH generation was coupled with the reduction of WST-1 and detected at 438 nm. GKTk activity was determined by coupling with G3PDHTt. The standard assay mixture for GKTk was composed of 50 mM HEPES-NaOH (pH 7), 0.2 mM glycerol, 0.2 mM ATP, 1 mM NAD+, 5 mM MgCl2, 0.5 mM MnCl2, 0.15 mM WST-1, 6 μM 1-methoxy PMS, an excess amount of G3PDHTt, and an appropriate amount of GKTk. The mixture without glycerol was pre-incubated at 60°C for 2 min, and the reaction was initiated by the addition of the substrate. Enzyme reaction was monitored through the reduction of WST-1 to the corresponding formazan dye at 438 nm using a UV-2450 spectrophotometer (Shimadzu Corp.). G3PDHTt assay was performed in the same manner except that 0.2 mM G3P was used as a substrate. TIMTt was assayed in a mixture containing 50 mM HEPES-NaOH (pH 7), 0.2 mM DHAP, 1 mM NAD+, 5 mM MgCl2, 0.5 mM MnCl2, 1 mM glucose-1-phosphate (G1P), an excess amount of GAPNTk, and an appropriate amount of the enzyme. After a pre-incubation at 60°C for 2 min, the substrate was added to the mixture and the reduction of NAD+ was monitored at 340 nm. For the determination of GAPNTk activity, 0.2 mM GAP was used instead of DHAP. Similarly, iPGMPh activity was assessed by coupling with ENOTt, PKTt, and LDHTt. The enzyme was assayed in a mixture containing 50 mM HEPES-NaOH (pH 7), 0.2 mM 3-PG, 0.2 mM ADP, 0.2 mM NADH, 5 mM MgCl2, 0.5 mM MnCl2, and excess amounts of ENOTt, PKTt, and LDHTt. The reaction rate was determined by monitoring the concomitant decrease of NADH at 340 nm. Assays for ENO, PK, and LDH were performed in the same mixture using 0.2 mM each of 2-PG, PEP, and pyruvate, respectively. NOXTp activity was determined by monitoring the oxidation of NADH under an air atmosphere. A reaction mixture comprising 50 mM HEPES-NaOH (pH 7.0), 5 mM MgCl2, 0.5 mM MnCl2, 0.02 mM flavin adenine dinucleotide (FAD), and 0.2 mM NADH was preincubated at 60°C for 2 min and then the reaction was initiated by adding an appropriate amount of enzyme. The reaction mixture (4 ml) was composed of 50 mM HEPES-NaOH (pH 7), 0.2 mM glycerol, 1 mM NAD+, 0.2 mM NADH, 0.2 mM ATP, 0.2 mM ADP, 0.02 mM FAD, 0.5 mM FBP, 1 mM G1P, 5 mM MgCl2, and 0.5 mM MnCl2. Enzymes were added to the reaction mixture to give the following final concentrations: 0.04 U ml−1 GKTt, 0.18 U ml−1 G3PDHTt, 0.04 U ml−1 TIMTt, 0.1 U ml−1 GAPNTk, 0.09 U ml−1 iPGMPh, 0.07 U ml−1 ENOTt, 0.09 U ml−1 PKTt, 0.08 U ml−1 LDHTt, and 0.04 U ml−1 NOXTp. The mixture was put in a 10-ml cylindrical vessel and kept at 60°C with stirring. Glycerol (160 mM) solution was continuously supplied to the mixture at a flow rate of 1 μl min−1 (0.04 μmol glycerol ml−1 min−1) using a Shimadzu LC-20 AD solvent delivery unit. Alternatively, a model solution of crude glycerol, which consisted of 160 mM glycerol and 770 mM methanol, was used as a substrate and fed to the reaction mixture in the same manner. NAD+ was put in the substrate solution at 4 mM and supplied into the reaction mixture with the substrate to complement the thermal degradation (0.001 μmol NAD+ ml−1 min−1). Aliquots (50 μl) of the reaction mixture were sampled at every 1-h intervals, diluted fourfold with distilled water. The sample was ultrafiltrated using Amicon 3 K (Merk Milipore, Billerica, MA, USA) and then analyzed by HPLC. Schematic illustration of the in vitro synthetic pathway constructed in this study. The standard Gibbs energy change (∆G°) of the reaction was calculated to be −256.4 kJ/mol. Crude extracts of recombinant E. coli cells were heat-treated at 70°C for 30 min to denature indigenous proteins and then used in following studies. SDS-PAGE analysis of the crude extract revealed that most of host-derived proteins were removed by the heat precipitation (Additional file 1: Figure S1). 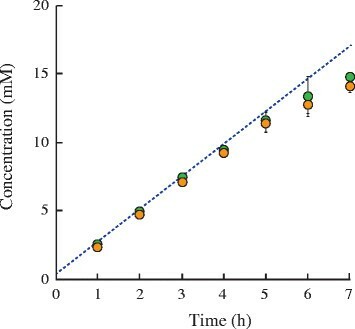 The enzyme stability was assessed by measuring the remaining activity of enzymes after the incubation at 60°C (Figure 2). Most enzymes could retain more than 80% of their initial activity for 8 h, except that PKTt lost 35% of the activity after the incubation for the same time period. We also investigated the effect of methanol, which is the primary impurity contained in crude glycerol, on the enzyme stability. Although residual activities of TIMTt, iPGMPh, ENOTt, and LDHTt were moderately lower than those in the absence of methanol (16% to 32% decrease), the destabilization profile of other enzymes were not significantly affected by at least up to 100 mM of methanol. Enzyme stability. Enzyme solutions were incubated at 60°C for indicated time periods and residual activities were determined under the standard assay conditions (green circle). Enzyme stabilities were also assessed at 60°C in the presence of 50 (blue circle) and 100 mM methanol (orange circle). The lactate production rate through the synthetic pathway was determined at different pH and temperatures by incubating 0.1 U ml−1 each of GKTt, G3PDHTt, TIMTt, GAPNTk, iPGMPh, ENOTt, PKTt, LDHTt, and NOXTp with 10 mM glycerol and appropriate concentrations of cofactors and metal ions (Figure 3). Glucose-1-phosphate (G1P) was put in the reaction mixture as an activator for GAPNTk. Although LDHTt is allosterically inhibited by NAD+, lactate dehydrogenases can generally be activated by fructose-1,6-bisphosphate (FBP). In fact, we found that LDHTt activity in the presence of 1 mM NAD+ could be recovered to the similar level to that under the standard assay conditions by the addition of 0.5 mM FBP (Table 1). When the reaction was carried out at 60°C in different buffers, the highest lactate production rate of 0.036 μmol min−1 ml−1 was observed in HEPES-NaOH (pH 7.0) (Figure 3A). The reaction was then performed in this buffer at 50°C, 60°C, and 70°C (Figure 3B). Although no significant difference was observed in production rates at 60°C and 70°C (P >0.1, Student's t-test), the reaction temperature of 60°C was employed for further studies to mitigate the thermal inactivation of the enzymes and the decomposition of thermo-labile intermediates and cofactors. 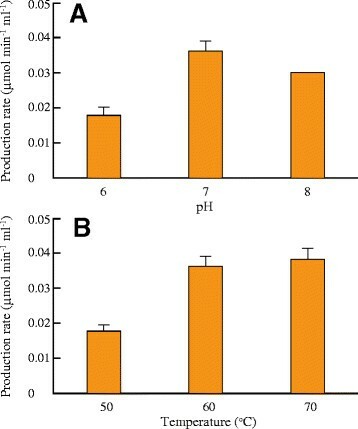 Effects of pH (A) and temperature (B) on the lactate production through the in vitro synthetic pathway. Enzymes (0.1 U ml−1 each) were incubated in a mixture of 10 mM glycerol, 1 mM NAD+, 0.2 mM NADH, 0.2 mM ATP, 0.2 mM ADP, 0.02 mM FAD, 0.5 mM FBP, 1 mM G1P, 5 mM MgCl2, 0.5 mM MnCl2, and an appropriate buffer. Reaction was performed at indicated pH and temperature for 30 min and then terminated by removing the enzymes with ultrafiltration. Fifty millimolar of MES-NaOH (pH 6) and HEPES-NaOH (pH 7 and 8) were used to adjust pH. Enzyme assays were performed with and without 0.5 mM FBP in the reaction mixture containing indicated concentrations of NAD+. Results were expressed as specific enzyme activities, which were assessed using a heat-treated cell-free extract and normalized by the protein concentration of the corresponding non-heated cell-free extract (U mg−1 protein). Unlike highly branched metabolic pathways in living organisms, in vitro synthetic pathways, in which only a limited number of enzyme reactions are sequentially aligned, appear to be less sensitive to the imbalance in enzyme concentrations. Although the existence of a rate-limiting enzyme leads to the accumulation of the specific intermediate, it is eventually converted by downstream enzymes without being routed into the co-existing pathway. However, the accumulation of chemically labile intermediates will result in their spontaneous degradation and decrease in the overall yield of product. We previously demonstrated that the flux through an in vitro metabolic pathway can be spectrophotometrically determined by dividing the whole pathway into some partial pathways, in each of which the NAD(H)-dependent enzymes are assigned to be the last step and by monitoring the concomitant consumption or production of NAD(P)H through the partial pathways . This real-time monitoring technique enables us to identify rate-limiting enzymes in an in vitro pathway by increasing the concentration of each enzyme, one by one. The optimum concentrations of enzymes to achieve a desired flux can be experimentally determined by modulating the concentrations of the rate-limiting enzymes ,. Accordingly, we divided the glycerol converting pathway in three parts, namely from glycerol to DHAP, from DHAP to 3-PG, and from 3-PG to lactate, and then adjusted the enzyme concentrations in each partial pathway separately. As a result, the optimum enzyme concentrations to achieve a lactate production rate of 0.04 μmol ml−1 min−1 were determined as follows: 0.04 U ml−1 GKTt, 0.18 U ml−1 G3PDHTt, 0.04 U ml−1 TIMTt, 0.1 U ml−1 GAPNTk, 0.09 U ml−1 iPGMPh, 0.07 U ml−1 ENOTt, 0.09 U ml−1 PKTt, and 0.08 U ml−1 LDHTt. Accordingly, NOXTp was put in the reaction mixture to give a NADH re-oxidizing rate of 0.04 μmol ml−1 min−1. A glycerol solution (160 mM) was continuously supplied to the mixture at a rate of 1 μl min−1, which is identical to the experimentally determined lactate production rate through the synthetic pathway, to maintain the pool size of the substrate and a constant flux through the pathway. Although the synthetic pathway was designed to achieve the balanced reduction and oxidation of NAD+ and NADH, the thermal decomposition of the cofactors was not negligible (Additional file 2: Figure S2). Owing to this fact, NAD+ was also continuously supplied to the reaction mixture at a rate identical to that of its thermal decomposition (0.001 μmol min−1 ml−1). The lactate production rate could be remained almost constant at the expected level (0.04 μmol min−1 ml−1) for the initial 5 h (Figure 4). Following this, 11.5 mM lactate could be produced with an overall molar conversion yield of 95.5%. Decrease in the production rate became significant after the initial 5 h, and the conversion yield dropped down to 88% at 7 h. This appeared partly due to the dilution of the reaction mixture (10.5% increase in the total volume at 7 h) caused by the continuous feeding of the substrate solution as well as the loss of enzymes by the sampling (8.8% decrease in the total concentration at 7 h). Decrease in the production rate might also result from the thermal inactivation of PKTt (Figure 2). Substitution of PKTt with another pyruvate kinase derived from hyperthermophiles with higher optimum growth temperature than T. thermophilius may be a possible means for improving the operational stability of the in vitro bioconversion system. Lactate production through the in vitro synthetic pathway. Production assays were performed using pure glycerol (green circle) and a mixture of glycerol and methanol (orange circle). Total concentration of glycerol fed into the reaction mixture was indicated by a dotted line. The final lactate concentration after the reaction for 7 h was 14.7 mM. The overall turnover number of ATP/ADP was calculated to be 36.8, while that of NAD+/NADH was 17.5. Enantiomeric purity of the product was determined using a BF-5 biosensor equipped with a D-lactate quantification unit (Oji Scientific Instruments, Amagasaki, Japan). Concentration of D-lactate in the reaction mixture was under the detection limit (approximately 0.05 mM), indicating that glycerol was enantio-specifically converted to L-lactate. The chemical composition of crude glycerol is highly varied with the types of catalysts and feedstocks used for biodiesel production processes . Hansen et al. analyzed the chemical composition of 11 types of crude glycerol obtained from 7 Australian biodiesel manufacturers and revealed that the glycerol content in the crude glycerol varied in the range of 38% to 96% and up to 16.1% of methanol was contained as an impurity . Moreover, Asad-ur-Rehman et al. reported that a raw glycerol obtained during the biodiesel preparation from sunflower oil contained 50% methanol, which is more abundant than the glycerol content (30%) . In order to assess the compatibility of the in vitro system with crude glycerol, a model solution of crude glycerol consisting of 30% (w/v) glycerol and 50% (w/v) methanol was prepared and used as a substrate for lactate production. The model solution was diluted by distilled water to give a final glycerol concentration of 160 mM (thereby the final methanol concentration was 770 mM) and supplied into the reaction mixture in the same manner as the lactate production with pure glycerol. The time profile of the lactate production with the model solution was almost identical to that with pure glycerol (Figure 4). After the reaction for 7 h, methanol concentration in the reaction mixture reached 47.8 mM, which was significantly lower than the calculated concentration of 80.5 mM probably due to volatilization. These results were in reasonable agreement with our observation that stabilities of most enzymes involved in the synthetic pathway were not markedly affected by up to 100 mM of methanol and demonstrated the potential applicability of in vitro bioconversion systems with thermophilic enzymes for the conversion of crude glycerol to value-added chemicals. In this study, we constructed an artificial in vitro metabolic pathway for the conversion of glycerol to lactate. The in vitro pathway consisted of nine thermophilic and hyperthermophilic enzymes and designed to balance the intrapathway consumption and regeneration of cofactors. The one-pot conversion of glycerol to lactate through the in vitro pathway could be achieved in an almost stoichiometric manner. Although the final product concentration obtained in this study was modest, the overall yield and the production rate of lactate were comparable to those in conventional fermentation processes . Besides, the in vitro bioconversion system can be operated in a simple buffer solution and thus would markedly simplify downstream processes including product recovery and purification. Furthermore, the in vitro bioconversion system exerted almost identical performance in the presence of methanol, demonstrating the potential of thermophilic-enzyme-based in vitro metabolic engineering approaches in the utilization of crude glycerol as a starting material for the production of value-added chemicals. On the other hand, although their contents are generally less abundant than those of methanol, crude glycerol contains many other impurities, including fatty acids, soap, and salts. Compatibility tests of thermophilic enzymes with these impurities and the implementation of the in vitro bioconversion with a real crude glycerol would be needed in future studies. This work was supported in part by the Japan Science and Technology Agency, PRESTO/CREST program. This work was also partly supported by the Japan Society for the Promotion of Science, KAKENHI Grant (26450088). CJ was supported by Japanese Funds-in-Trust, UNESCO Biotechnology School in Asia program and Graduate School Thesis Grant, Chulalongkorn University. CJ performed the experiments and wrote the manuscript. SCN supervised the work and wrote the manuscript. MC co-performed the experiments, particularly on the enzyme stability. KO and HO contributed general advice and resource support, as well as edited the manuscript. KH designed all the experiments and wrote the manuscript. All authors read and approved the final manuscript.